For starters, don’t call it a singles party because your guests may not feel comfortable announcing to the whole world that they are unattached and ready to mingle. Just bill it as a regular party where only your unattached friends happen to avoid (because surely, the couples have their own things to do). The next thing you need to determine is your purpose for throwing this party. Are you a happily married gal who just wants to see your single friends mingle with each other and maybe spark a romance? Are you unattached, too, and looking for someone to start a romantic relationship with? If you think throwing a bash is the answer to end your single-blessedness, then who’s stopping you from hosting a big bash? Oh, the work involved in getting everyone in your place and having the time of their lives? Don’t worry, we’ve got you covered. This is not a Super Bowl party, which means you cannot serve bottles of beers. More than anything else, you want this to be a bit more cultured. No rowdy sports talk or anything like that at all. You then need a signature cocktail drink, one that everyone will love to drink and be merry with. You can check out some of the cocktail recipes online and make one before the party to determine what you want. Make sure to have enough supplies to produce this drink in large quantities so no one will be left wanting. Stay away from Valentine’s Day décor. 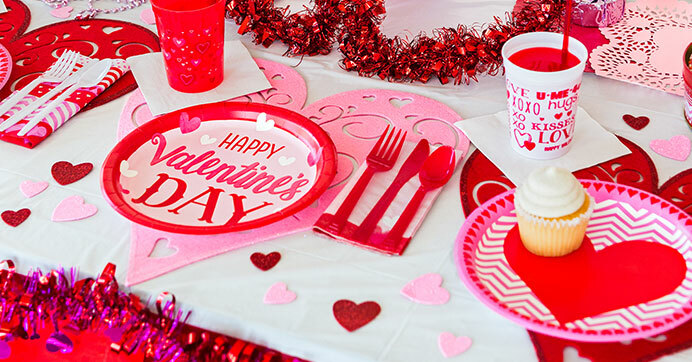 Though it is tempting to fill your space with heart-shaped balloons and red tablecloth with red kiss marks as design, try not to be too cliché. Instead, make your space look and feel happier with brightly-colored décor in the hues of turquoise, tangerine, lime green, yellow, etc. Trust us, this will put people in the mood. There’s no need to spend on a stylist to decorate your place. There are many places both online and offline where you can get party supplies. Simply hang decors or paste them up on your walls so your apartment will look and feel festive. The romance-inducing ingredients you must have on the table are chocolates, figs, pears, dates, apples, honey, cream, oysters, lobsters, wild mushrooms, and even tortellini. Throw a combination of these and you should all be heading to a romantic night. What would fuel strangers to talk to each other? Food! It’s honestly the great equalizer. Ask people to bring their own dishes to the party so everyone can talk about how good the dessert is or how the appetizers just make them yearn for more. Remove loungers and chairs from your space that will encourage people to sit and not mingle. Let them stand on their feet. The longer they stand, the more they need to start a conversation to forget about the pain shooting up their legs. People tend to converse more when they are standing. Also, do not even attempt to open the TV.